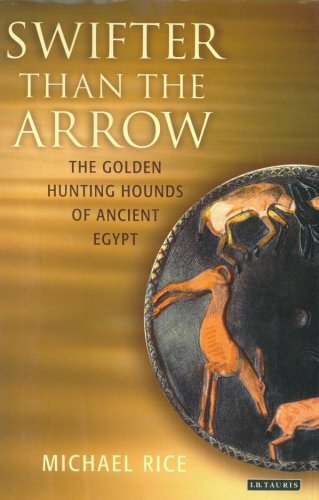 AE has published a few articles in the past year or so on the topic of dogs in ancient Egypt, so it was with satisfaction that I came across this book. I was happy to add it to my library because it covered a subject close to my heart and I thought it would be a valued addition. I was not disappointed. The tjesm was the result of specific breeding for the hunt; not a sprinter and similar to a greyhound, but a well-built, muscled hound that could hunt and run all day and having the ability to track quarry by sight, smell and sound. The author then looks at the continuing relationship when the hound became the valued companion and was taken into people’s hearts and their homes; and he shows the affection lavished on them. This extended to tomb reliefs showing the tomb-owner's favourite hound walking with him, under his chair or hunting with him. The next part deals with the hunt and its management, leading to the elevation to royal patronage of the hounds and the specially appointed people to look after them. The tjesm’s features are depicted clearly and we see and can recognise the breed features – the elegant, slender prick-eared hound – the same image from Predynasty to the Late Period, and here the author explodes one of the great myths and widely followed views that everything ‘prick eared’ must be a jackal. These are not domesticated jackals, they are dogs, specifically hounds. And that leads us into the next area of popular misconception, which deals with the canine gods of ancient Egypt. Usually, representations of an animal with prick ears are referred to as Anubis the jackal or the jackal-headed god, and this is wrong as many scholars now accept. The author asks, and answers the question, “Is the tjesm with us today?” Many think he is, or at least direct descendents scattered around the Mediterranean. The leading candidate is the Kelb tal Fenek, or Pharaoh Hound, on Malta that is the virtual image of the tjesm in type, feature, colour, character and size. It is therefore not surprising that given their proximity to Egypt, a strong link probably exists. We also have the Cirneco dell’Etna from Sicily, the Pondenco and the Ibizan Hound, which have similar characteristics, just size differences probably due to evolving in different terrains. Such a link is often questioned, but we find Egyptian traces, hieroglyphs and artefacts all around the Mediterranean caused by trade, so why might dogs not have been traded too? What proof do you want – a collar with a dog tag engraved “Please return to Mereruka, Saqqara, Egypt if found”? This is a very well written, interesting and carefully researched book that I am happy to recommend to the readers of AE. You will find it rewarding whether you have your own interest in dogs, (whether you accept a modern link or not) or as a new view of the life of the people in the Nile Valley and their gods. Hopefully it will also be another step in the general acceptance of this hound in Egyptian life and will mark the end of the almost universal assumption that most representations are jackals. P Brian was the author of an article on dogs in AE vol. 2, Issue 5. Published by I.B. TAURIS, 2006. ISBN 978 1 84511 116 8 Hardback, price £20. Thutmose III was undoubtedly Egypt’s greatest warrior pharaoh, though it is often Rameses II who is given that title, and it is good, therefore, to see a new book by an author whose aim is to set the record straight. 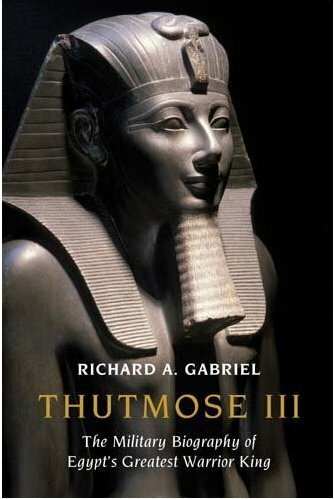 Surprisingly, there are few books that cover the campaigns of Thutmose in detail, his major achievements and creation of the Egyptian Empire, which was to reach its zenith in his reign. We are lucky that contemporary accounts of Thutmose’s campaigns survive and, using these, the author brings them to life. I am not sure, however, if it is always safe to assume we can determine the character or personality of anyone from the statues and reliefs that survive, and if indeed Thutmose was “smiling and content” when in battle as the reliefs seem to indicate. On the subject of representations, we have no real contemporary images of the campaigns and this book is sparsely illustrated (with some very nineteenth century-looking line drawings of soldiers and equipment). Apart from the head of the king from a smiting scene at Karnak used at the start of each chapter, the only other image of Thutmose is on the cover. It might perhaps have been better to include an image of the king himself, for as readers will know, his mummy survives. Concentrating on Thutmose’s military career, the author gives some background to the early years of his reign, before looking at the strategic setting of Egypt, Canaan, the Mittani and Nubia and at the Egyptian army and equipment compared with the enemies of Egypt. The bulk of the book examines some of Thutmose's campaigns, with one chapter specifically on the battle of Meggido. The author sheds new light on the Meggido campaign and interprets the account in Thutmose’s Annals, relating them to the topography of the area around Meggido and the route (or possible route) of the march of the Egyptian army. In this book we learn how Thutmose reformed the army, creating a reliable conscript base and a professional officer corps. The emphasis is on the importance of understanding the terrain, logistics, how to move, feed and equip a huge army and how the battles were fought. Thutmose’s soldiers used the latest weapons and he developed new tactics, making the Egyptian army powerful, efficient and victorious. His military and diplomatic policy created and consolidated the Egyptian Empire in a reign that influenced the history of the entire eastern Mediterranean. This is a major contribution to the area of ancient military history, and, for those that may not have been already aware, confirms Thutmose’s superior military prowess over other pretenders to this title. Published by Potomac Books, 2009. ISBN 978 1 59797 373 1. 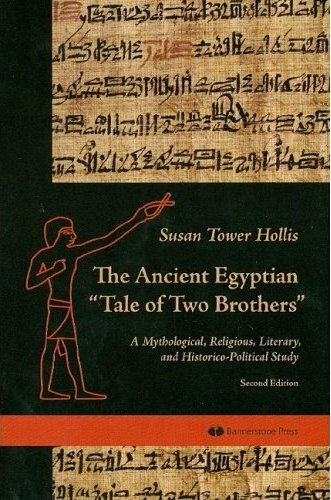 The Ancient Egyptian "Tale of Two Brothers"
The well-known Tale of Two Brothers is a rare survival of a story from antiquity, so similar in form to European folktales. It is a rite of passage, telling the story of a shepherd, Bata, a handsome and chaste young man who rejects seduction by a powerful older woman and, after many adventures, becomes King. The story is intertwined with that of his brother Anubis who eventually becomes King himself. The tale also has traits peculiar to ancient Egypt in that that the main characters are gods, connected with mortuary cults, as well as kings. The story is full of religious symbols of rebirth. Beginning with the actual story, the author then, using comparative analysis, helps us to understand a story that has puzzled folklorists for almost one hundred and forty years. 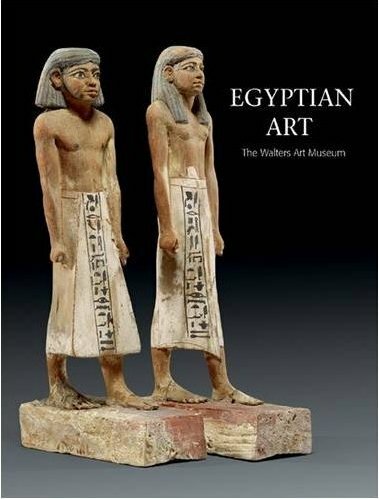 Most importantly, using literary, mythological and wisdom texts, cultic materials, historical and political works, and Egyptian paintings, reliefs and sculptures (although sadly no illustrations of these are included in this book) she puts the story securely in its historical context. This is a second edition of this classic, first published in 1990, and will be of great interest and use to anyone interested in reading and understanding ancient Egyptian literature. Published by Bannerstone Press, 2008. ISBN 978 0 9774094 2 6. Henry Walters (1848-1931) assembled a remarkable collection of Egyptian antiquities, one of the finest in the United States, now housed in a museum that bears his name. The collection has since been added to by acquisitions, gifts and loan items. One of the strengths of the collection is the statuary: mostly small-scale works, but nonetheless important pieces and all of the highest quality. This publication features more than seventy selected works from the collections, ranging from the Early Dynastic Period right through to the Graeco- Roman Period. Many objects are published here for the first time. The book uses the tried-and-tested format of including an illustration of the object with a page of information, including a full description of the object, its provenance and its historical and artistic context and importance. The entries are well written and the photographs are of the highest quality. It is easy to read and can be dipped into and enjoyed or read from cover to cover and will certainly be useful as a reference book. There are some exquisite, unique and important pieces included in these pages and the book is the next best thing to actually visiting the collection. It brings the museum’s wonderful collection to a world-wide audience. Published by The Walters Art Museum, Baltimore, 2009. ISBN 978 1 904832 57 7. In recent years travellers in the Eastern Deserts of Egypt have re-awakened interest in the rock art to be seen there. There have been some publications illustrating the rock art, but here the author has begun the difficult task of analysing the data available to try to understand the art and the artists, and the communities who made them. The images, including animals, humans and boats from the Eastern Desert have been collated and studied and also compared with examples surviving from the Nile Valley. The author has examined ways that the art can be dated, which include the differing patina on the inscriptions, assuming that the darker the patina, then the older the image. The reasons for the creation of the art are discussed, such as religious, magical or shamanistic practices, but it does not rule out the possibility that many may have been ‘doodles’ or ‘jokes’. The conclusion is that in many cases we can never be certain of the motivation of the artists. The presence of the art in what are now remote sites, tells us much about the people who inhabited the area and also is a vivid record of the climate change in the area over the millennia. This is a significant publication and will be of interest to anyone undertaking further study of the subject. ISBN 978 1 4073 0584 4. This is the first paperback edition of this title, published in the UK in 2001, and a volume that will be welcomed by many. Readers may be forgiven in thinking that there have more than enough books published on the subject, but the majority are lightweight compared with this fact-filled 495-page book. 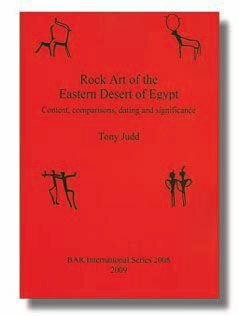 Gathering together all the latest research on the subject, the author, who has been excavating for many years at the Old Kingdom pyramid site of Abusir, has produced a very readable and comprehensive introduction to the subject. 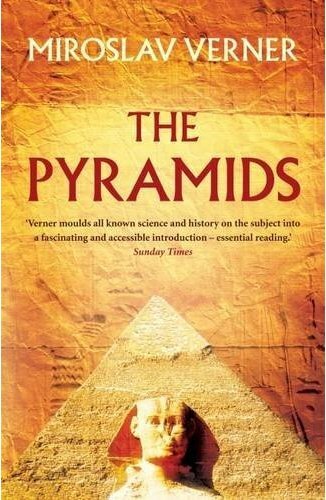 If you only want one book on the pyramids, full of facts, diagrams and plans (though sadly lacking in photographs) then this is the book to buy. Small in size, you can slip it into your pocket and learn all about the pyramids, wherever you are. Published by Atlantic Books, 2009. ISBN 978 1 84354 890 4. This is the latest archaeological report on the work of the Czech Institute of Egyptology at the Old Kingdom site of Abusir. Abusir XIII looks at one particular tomb complex, work on which began in 1995 and ended in 2002. It is the first of a planned three volumes on the subject. Qar was an important official in the reign of Teti (2345-2323 BC) whose titles included ‘Overseer of the Great [law] Court’ and ‘Administrator of the King’. His high status warranted a large tomb for himself and his family and although little of the tomb was visible above ground, parts are well preserved with much decoration remaining in situ. This first chapters include the results of a geophysical survey of South Abusir, a study of the plant and animal remains and a report on the geology of Abusir (this chapter written by Colin Reader, who is a regular contributor to AE). 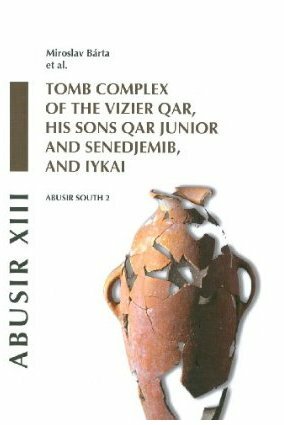 Chapters then look at the individual tombs, at the physical remains of the tomb owners, at funerary food offerings and at the cemetery of Qar and its place in Sixth Dynasty history. The work of the Czech Institute of Egyptology at the site over decades has revealed much new information, not just about the monuments, but about the individuals who had them built. 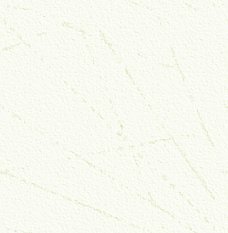 This is a technical excavation report, one which will be essential reading and a reference for anyone undertaking a serious study this period of Egyptian history; and certainly for anyone working at the site (or indeed any Old Kingdom necropolis) in the future. It is well written and illustrated and anyone will find a great deal of interesting and useful information in its pages. This book gives a fascinating insight into the complexities and skills needed in excavating such a site and the amount of detailed recording and analysis necessary to make the most of the information uncovered. Published by the Czech Institure of Egyptology, 2009. ISBN 978 80 87025 21 5. Votive stelae can be found in most Egyptian collections in museums. Often small, portable and decorative, these round-topped slabs of stone were often taken from Egypt as souvenirs of a tour, or bought on the art market by collectors. However, these monuments have a meaning and a specific link to the individuals who had them made, often commemorating an event of importance. 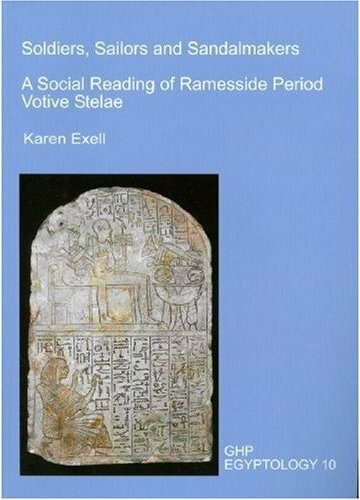 In this book, the author looks in some detail at stelae that date to the Ramesside Period (1295-1069 BC). Often erected in temples and local chapels, some were placed originally in a domestic context and the author seeks to look at the stelae not as museum objects but in the context of why they were made and where they were originally placed. This is a scholarly and detailed volume, aimed at the serious student. It looks at a total of four hundred and thirty-six stelae created by private individuals, many of whom worked at Deir el Medina, with occupations that included draughtsman, sculptor, scribe, and even, as included in the title of the book, a sandal-maker. Others were made by soldiers and sailors, and a number by people who worked in various capacities in the temples of Egypt. Small monuments they might be, but ones which are every bit as important and revealing as the great monuments of the pharaohs. ISBN 978 1 906137 10 6. At the end of the nineteenth century two cache burials were found containing the bodies of many of the bodies of New Kingdom pharaohs, members of their families and high officials. The survival of so many important bodies is little short of miraculous, and the circumstance of their discovery remains one of the most intriguing stories in Egyptian archaeology. A few other royal mummies, or mummies of high officials, were found in other tombs and many of these can be seen today in the Egyptian Museum in Cairo. The author has been researching all the aspects of the cache burials for a planned series of publications. This volume is Part Four in the series (though, perhaps confusingly to the reader, is the first one to be published) and looks at identifying the Royal Mummies. Identification of many of the mummies has been a subject of interest for over a hundred years. Whilst some bodies were named in antiquity, many went to the tombs bearing no name, and even the identity of some of the named bodies has been questioned. 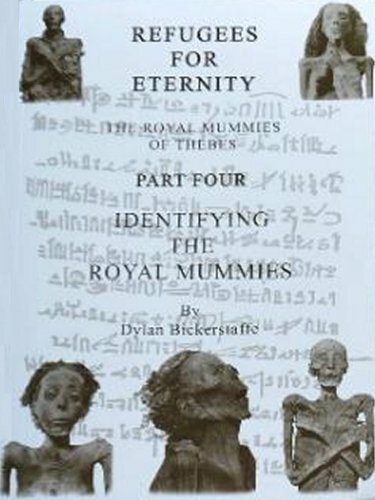 This volumes begins by looking at the various ways of identifying the mummies, ranging from the obvious inscriptions on coffins and bandages, to the position of the arms and the mummification technique used. The next section looks at each of the individual mummies, although there is some repetition of information and overlap between the two sections. The author provides an analysis of the information available and comments if any identification is positive or doubtful. The author rightly questions many of the ways used to determine the age of a body at death and raises the same arguments as in the article by Aidan Dodson on this subject in AE46. There are large entries for some of the mummies, such as the recently identified mummy of Hatshepsut, the three unknown mummies in the Tomb of Amenhotep II and the mummy identified as possibly being Rameses I and now on display in the Luxor Museum. The author brings together all the arguments and ideas proposed in the past, and, interestingly in the case of all these mummies, concludes that any identification is still not secure. A chapter is devoted to the case of ‘Unknown Man E’ found in the first Royal Cache, and the subject of much discussion and debate as to his identity and the manner of his death. Some have argued that this individual was buried alive. The list of possible identifications for this body over the years, as the author shows, is impressive, many based on the premise of the man being buried alive, which recent CT-scans have ruled out. At the end of the day, it would seem, we are not really any further forward with his identification. The one glimmer of hope is the current programme of DNA testing on the royal mummies, though the author points out the problems with this approach. Ultimately it would seem we will have to wait for new or more reliable scientific techniques to help us. In the meantime this volume is a useful collection of all the current information and present and past ideas on the subject. The book is illustrated with archive (though small) images of most of the mummies, though I think it is a shame that individual photographs were not included with the written entry on each body. Perhaps the format will be different when the other volumes appear. Published by Canopus Press, 2009. ISBN 978 0 9561875 1 2.